Red Garage Cabinets to Match a Red Corvette? Yes, We Can Do That! Create a unique look for the garage that matches the car. Organizing your garage allows you to easily access items such as sporting goods, holiday decorations, tools, etc. while giving you the ability to work on projects and still have room to safely park your car in the garage without the worry of scratching it. Combining the storage that our Garage Cabinets offer with beautiful and durable floors will enhance and extend the lifetime of your garage, as well as keep it clean and easy to maintain. This garage makeover in Montana delivers a customer look by matching the garage cabinets with the customer’s car. The red cabinets with black channel pulls really stand out and add a pop of color to the garage. The cool custom appearance was continued throughout the garage with a charcoal slat-wall with black 6-inch fillers to match the black channel pulls on the cabinets. 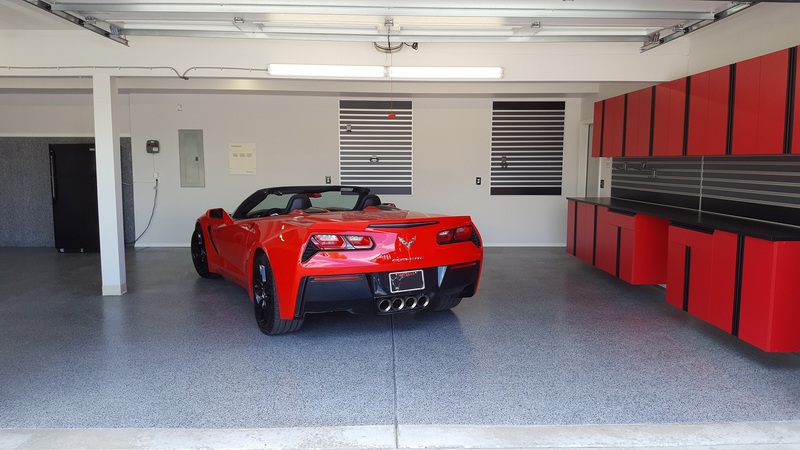 The floors in this 3-car garage were coated with our Roll On Rock® Epoxy Flake ¼” Graphite flake with two coats of our industrial strength Polyaspartic coating. The 6-foot foundation walls were even coated to give this garage makeover a cohesive, polished look. Customize a garage with storage options that fit a family’s lifestyle, as well as enhance the look of the home. Begin by determining which items need to be stored long-term (such as holiday decorations or keepsakes) and what needs to be easily accessed (like tools or sporting equipment). This will make it easier to decide which individual storage solution is best, or if a combination of these solutions makes the most sense. Cabinets – Organize and store garage clutter in custom designed cabinets. GarageCoatings.com cabinets are made-to-order, and custom built in America using rear-loading panel saws, point-to-point CNC machines, and high-speed edge banders to craft every garage storage cabinet order to exacting precision. Our cabinets are designed to provide tremendous storage capacity that can withstand the harsh elements found in a typical garage. The cabinet doors have full-width openings with no center posts, allowing large objects to be easily stored. The shelves have maximum adjustability, allowing them to be moved to fit any size item. Each shelf is 1-inch thick with a 75 lb weight capacity. Optional support legs are also available if the garage cabinet’s will be holding weight to exceed 300 lbs. The cabinets have easy to-clean thermo fused melamine interiors and exteriors to guard against stain and spills, and beautiful stainless steel finished handles. And, all the storage cabinets are mounted directly to the wall to allow for easy cleaning underneath the cabinets. GarageCoatings.com offers a variety of makes, finishes and hardware choices to create a garage color scheme that best matches a home’s décor or style. Slat-Wall – Increase the usefulness of a garage with a slat-wall storage system. This sturdy and durable storage option was designed to complement the GarageCoatings.com cabinet hardware for a cohesive look in the garage. There are more than ten different styles of hooks, shelves and baskets to snap into the metal channel slat-wall. They will hold anything up to 50 pounds, including tools, sports equipment and seasonal items. All the slat-wall accessories are moveable and adjustable, allowing the storage system to change as needed. Choosing the right storage option is an ideal way to custom tailor any garage to look better and be more useful. An Epoxy coating gives concrete floors a beautiful, high-gloss finish with the strength and durability to last a lifetime. The GarageCoating.com Epoxy floor coating makes the concrete floor resistant to spills and stains, abrasions, harsh chemicals and hot tires. It’s also easy to clean and maintain using water and a mild (non-filming) detergent, and requires no special maintenance or waxing. To enhance the décor or style of any home, the Roll On Rock® Epoxy Flake comes in different flake sizes and more than 80 color treatments to choose from. It can be applied to any concrete floor area, giving a hard, resilient surface that is moisture- and freeze-resistant. Additionally, the Epoxy topcoat is UV tolerant, so the color of your floor won’t fade or cloud up over time, and it’s an ultra-low VOC green product that is safe to use indoors and doesn’t harm the environment. The GarageCoatings.com Epoxy is the strongest in the business – more than three times stronger than the standard off-the-shelf Epoxy flooring. The proprietary “wicking” technology in GarageCoatings.com Epoxy base coat makes a floor flexible and almost bullet proof, giving it industrial-strength durability that lasts a lifetime. Our fast-drying polyurea and polyaspartic floor coatings deliver a commercial-grade, high-gloss appearance, and industrial-grade strength on every installation. Our topcoats are formulated to be fast-drying when applied, while still retaining pot life. The results of our products are walk-on times as low as two hours and abrasion resistance levels up to 400% of those offered by standard polyaspartic floor coatings. The high-gloss, high-build film of our Polyaspartic/Polyurea Floor Coating/Sealer provides a beautiful topcoat finish that will look great for years. Creating a custom look for a garage can be fun, as well as make a more efficient use of space and increase the value of a home.